How Much Should You Praise Your Child? Praising Your Child – Raise or Reduce? The terms ‘good boy’ and ‘good girl’ have been used since the mid-1800s by parents, mentors, teachers towards children. The idea of using praise to motivate children really took off after the publication of ‘The Psychology of Self-Esteem’ in 1969, which suggested that many of the problems among people in society resulted from lack of self-esteem. Ever since, ‘praise’ has become a way of boosting children’s self esteem. New research, in recent years has shown that too much praise may actually undermine confidence in a child. Parents must know when to deliver praise and when not to. “Research has revealed that if a child is praised for trivial, common efforts for example, ‘wow, you woke up early this morning!’ such type of praise will lose its rewarding power and strength. It will simply be looked upon as ordinary as ‘background noise’. It may encourage thoughts and feelings such as ‘’why work for something you will get anyway, regardless of whether or not you try?’Therefore praise which is not ‘specific’ such as ‘you are awesome also undermines confidence, because a child has no way of knowing what this really means (awesome why? as opposed to what?) and what it takes to achieve ‘awesomeness.’ Parents must remember that the goal of praise should be to increase desired behaviours, so that the child continues to express himself/herself in positive ways. In the long run, we want our children to gain confidence in expressing themselves and to persist in creative endeavours, as well as manifest strength when faced with problems and challenges,” opines Prof. Susannah Malkan, Head of Sociology Department Somaiya Vidyavihar. When praising a child, the quantity does not matter so much as the intention and purpose behind the praise. “Rather than praising the results of their actions, praise the actions themselves. This type of praise brings about a growth mindset, leading a child to focus on what they can do, and how they can do it better, instead of whether they’re good at something or not,” says Tristha Ramamurthy, Founder & Managing Director, Ekya Schools. Praise should be given according to the level of effort put in by the child. So if a child tries a new activity for the first time even though he/she was shy at first, then it is important to praise the effort that was made to just get to the class. “Once they get comfortable with the rest of the class and teacher and no longer need to put in an effort to get there, then the praise should shift to other aspects where they ended up putting an effort, such as running as fast as they could or trying for a goal. Praise is best received when its action specific, rather than a generalised blanket statement such as “you’re so good at swimming”. Instead one could say “your breathing control seems to be so smooth now” or “your backstroke is getting stronger”. There are times of course when blanket comments are used but they should be the exception and not the norm. Paying attention and staying attuned to the child helps in gauging how much to praise. The common situation could be a child tackling a difficult maths sum sitting while next to a semi attentive parent who is on his computer. When the child says “I got it!” if the parent half heartedly says “that’s great” without actually knowing how much the child had to work to figure it out, the praise will not match the effort,” says Dr Bagadia Ashlesha Jeetendra, Consultant, Fortis La Femme, Bangalore. A new study claims that, kids who think too highly of themselves are likely to develop ‘narcissism’ as their parents placed them on a pedestal and doled out unearned praise. 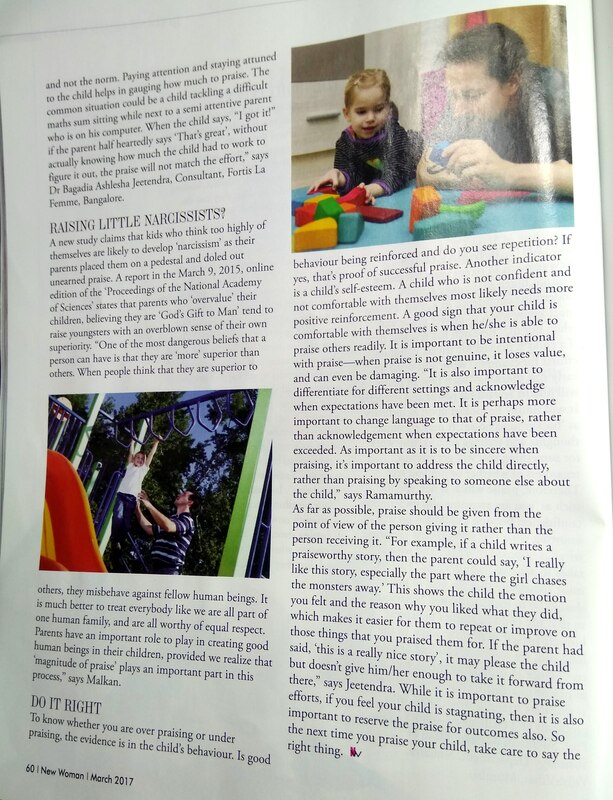 A report in the March 9th 2015, online edition of the ‘Proceedings of the National Academy of Sciences’ states that parents who ‘overvalue’ their children, believing they are ‘God’s Gift to Man’ tend to raise youngsters with an overblown sense of their own superiority. “One of the most dangerous beliefs that a person can have is that they are ‘more’ superior than others. When people think that they are superior to others, they misbehave against fellow human beings. It is much better to treat everybody like we are all part of one human family, and are all worthy of equal respect. Parents have an important role to play in creating good human beings in their children, provided we realize that ‘magnitude of praise’ plays an important part in this process,” says Malkan. To know whether you are over praising or under praising, the evidence is in the child’s behaviour. Is good behaviour being reinforced and do you see repetition? If yes, that’s proof of successful praise. Another indicator is a child’s self-esteem. A child who is not confident and not comfortable with themselves most likely needs more positive reinforcement. A good sign that your child is comfortable with themselves is when he/she is able to praise others readily. It is important to be intentional with praise – when praise is not genuine, it loses value, and can even be damaging. “It is also important to differentiate for different settings and acknowledge when expectations have been met. It is perhaps more important to change language to that of praise, rather than acknowledgement when expectations have been exceeded. As important as it is to be sincere when praising, it’s important to address the child directly, rather than praising by speaking to someone else about the child,” says Ramamurthy. As far as possible, praise should be given from the point of view of the person giving it rather than the person receiving it. “For example, if a child writes a praiseworthy story, then the parent could say “I really like this story, especially the part where the girl chases the monsters away.” This shows the child the emotion you felt and the reason why you liked what they did, which makes it easier for them to repeat or improve on those things that you praised them for. If the parent had said “this is a really nice story” it may please the child but doesn’t give him/her enough to take it forward from there,” says Jeetendra. While it is important to praise effort, if you feel your child is stagnating then it is also important to reserve the praise for outcomes also. So the next time you praise your child, take care to say the right thing.